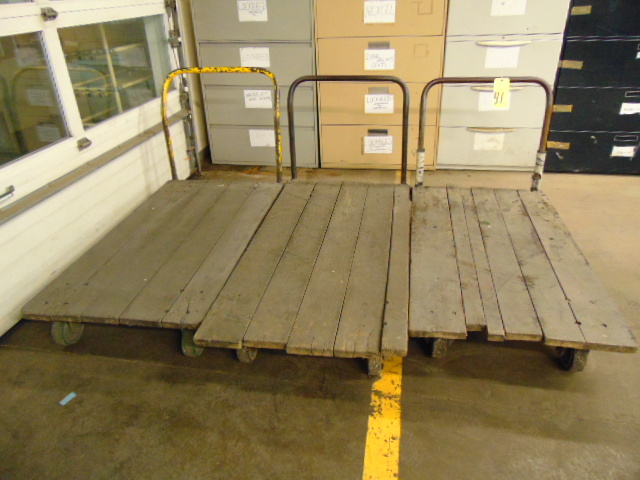 LOT OF PLATFORM CARTS (3), 56" x 30"
You are the current highest bidder! To be sure to win, log in for the live auction broadcast on Apr 24, 2018 9:30am CDT or increase your max bid. LOT OF PLATFORM CARTS (4), 56" x 30"
HIGH PRECISION AEROSPACE COMPONENT FACILITY, FEATURING: (2) CINCINNATI MILACRON 40V-120 5-AXIS CNC MILLS, CINCINNATI MILACRON 20V-120 5-AXIS CNC MILL, (2) MORI SEIKI MV-65/50 4-AXIS VMC’S; KITAMURA BRIDGE CENTER 8 VMC; (4) ADDITIONAL VMC’S BY OKK, KURAKI & OKUMA; DAEWOO ACE H50-S 4-AXIS HMC; LARGE SELECTION OF TOOLHOLDERS & TOOLING; WIDE ARRAY OF PLANT SUPPORT MACHINERY; AIR COMPRESSORS; FORKLIFTS; SHOP EQUIPMENT & MUCH, MUCH MORE! Loading, Rigging and Shipping are at buyers expense.